Much of our electricity is generated by gas turbines, internal combustion (IC) engines that produce power by burning air-fuel mixtures that throw off hot gases which in turn spin the turbines. The Combined Cycle Journal covers trends and best practices for the gas-turbine-based generation sector of America’s electricity industry and is referenced by electric-generation professionals who design, construct, manage, operate, and maintain these types of power plants worldwide. Each year, the publication recognizes Best of the Best 2016 Best Practices Award. This year’s award includes a solution recommended by PTLF Process LLC for a much less expensive and simpler installation of Assured Automation’s NV Series direct-drive gear-style design actuator. The NV Series replaced an obsolete belt-driven fuel-gas and fuel-oil ball-valve actuators at a whopping 10% of the cost of the OEM for the Siemens V84.2 generator. 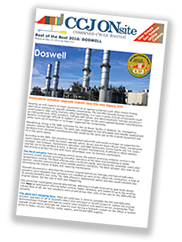 The 933-MW Doswell Energy Center in Ashland VA was constructed in 1992 using Siemens V84.2 generators. The original estimate to replace one obsolete belt-driven actuator with the OEM solution was $18,000 each. 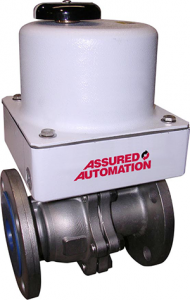 PTLF Processes recommended using Assured Automation’s NV Series simple direct-drive gear-style design actuator instead. The NV Series provides better control, higher reliability, and instant fit-up to the existing valves. 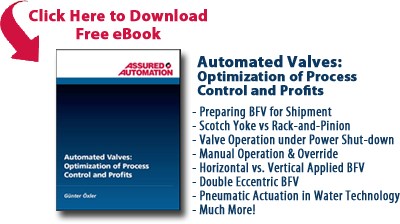 At 10% of the OEM estimate, the Assured Automation NV Series gear-driven actuator and installation drastically reduced the maintenance cost for the facility, which required 24 replacements. Many power generation plants face similar issues with aging Siemens V84.2 generators throughout their facilities. The Doswell Energy Center was able to vastly reduce the cost of the repair and maintenance on these turbine engines by special ordering the NV Series gear driven electric actuators with the assistance of Assured Automation’s Russ Gallo. Russ has extensive experience with this MRO project and is available to share his experience and assistance. He can be reached at russg@aa-fs.com, or by phone at 732-281-2255. When ordering, please specify whether you will need 12 or 24 Volt DC motor. The wiring diagram can be found on our website and inside the actuator cover. This entry was posted in Custom Projects, Latest News. Bookmark the permalink.